At the outlet of the shrink tunnel of SMI shrink wrappers, it is possible to install an additional conveyor, equipped with a fan, which allows a quicker cooling of the shrinked bundles, in order to obtain immediate stiffening. This accessory prevents any deformation of the bundles coming out of the machine, especially during the transfer onto the conveyors and during the palletization operations. 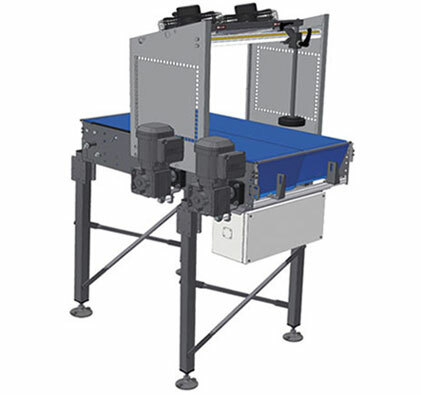 It is an ideal solution for high-speed lines; it can be 800 or 1500 mm long and can be equipped with the pack turning device, for specific packaging exigencies. This accessory, designed for turning the packs from the short side leading to the long side leading or vice versa, can be used with bundles in film only, trays and cardboard cases. The use of plastic chains eliminates frictions and wear of the conveyed product. It is available with differentiated speed chains and with contrast pivots.